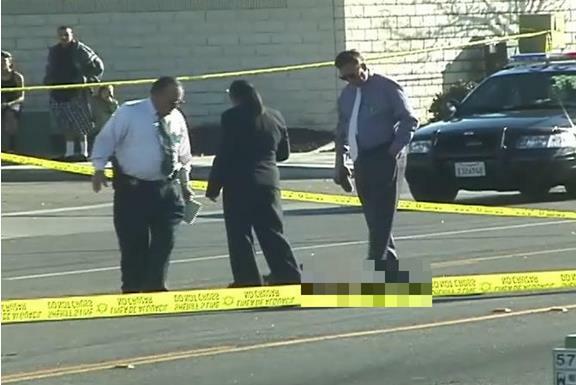 PALMDALE – The man found dead in the middle of a Palmdale street early Sunday morning has been identified as 31-year-old Raul Machado of Van Nuys, authorities said Thursday. Machado died of “cranial cerebral trauma” and “multiple sharp force injuries,” said Lt. David Smith of the Los Angeles County Coroner’s Office. Machado’s death has been ruled a homicide, Smith said, adding that he could not elaborate beyond what was listed on the death certificate. Around 4:30 a.m., Sunday, Feb. 16, Machado was found bleeding and motionless in the middle of the street at the intersection of 57th Street East and East Avenue S in Palmdale, homicide detectives said. The call came in from a passing motorist, and Machado was pronounced dead at the scene, according to Lt. Dave Coleman of the Sheriff’s Homicide Bureau. Detectives are still investigating the circumstances surrounding the homicide, Coleman said Thursday. 6 comments for "Man found dead in street ID’d"
Looks like Det. Sandy Nava…if it is she will surly solve this case…she is Great! Friday avpress reports he was an exconvict from Van Nuys, just released from jail. Guess they decided SFV wasn’t a good enough dumping ground. An exconvict? That’s what we are calling Raul?almost makes it sound like he deserve what he got. But no people he wasn’t a criminal he was a man with a mental illness. Yes he had end up in jail, but never for hurting anyone only for stealing peoples food from taco bell and going into stores and asking for cigarettes. So sorry that this society was so bothered by him that they called the cops. Police don’t know what to do with mentally sick people so they just lock them up. He was no criminal he was a mentally sick person with the mentallity of an 8 ur old according to his doctors. He didn’t deserve to be beaten to death I don’t care what Hus “criminal record” said. Finally an up date of this grime. I feel sad for the family, I pray that this case gets resolve. I hope it does not take months to solve this mystery. I can’t help but notice the guy in the background has a small child with him. Nice parenting (sarcasm). Good grief.